Johannes Roberts, director of British ‘hoodie’ horror F visited Bracknell and Wokingham College on Tuesday 12th June to discuss his career and upcoming film, Storage 24, with media students. After a screening of F, Roberts was invited to participate in a Q&A with the students in order for them to gain a vital and exciting insight into what it takes to make it in the modern British film industry. Go to Soho and get a job as a runner, perhaps in a post-production house and then work very hard and climb the ladder. Go to university if you can afford it. He said university can be a chance to make mistakes, to get access to free equipment and to meet like-minded people. Do as Johannes did and just start making films with whatever means you have at your disposal. Johannes talked about the funding of F which started with £30,000 coming from an investment banker and the budget eventually increased to £100,000. He used many students in the crew and secured the free use of the college that is featured as really the only location in the film. The director said he is drawn to sterile locations like this and has done features in hospitals, a school and his latest takes place in a storage facility. The film was deliberately written with a low budget in mind and therefore it is primarily one location and mostly interiors in order to keep costs down. The three 16 year olds who played the mysterious, animalistic hoodies were found nearby climbing up walls and were paid nothing for appearing in the film. Another great way to keep costs low! Their movements were all choreographed on set. Johannes mentioned his desire to make a ghost story and this can clearly be seen in his use of the faceless, fleeting glimpses of dark figures that menace his characters. Another way to keep costs down was to limit the visible gore as it is expensive and time consuming to produce these make-up effects. Johannes also discussed the need to be conscious of your audience. Although Studio Canal/Optimum picked the film up for cinema distribution, there were concerns and questions over the protagonist of the horror film being a 65 year man. Johannes recognised the need when writing the script for a younger pretty girl who would appeal more to the target audience of teens, particularly male. This resulted in the casting of Eliza Bennett as the daughter of the protagonist played by David Schofield. He also test screened the film at a college in Peterborough to gain some feedback from the target audience. The decision to end the film on quite an ambiguous note was also addressed by the director. He justified the very open ending by stating that the film ends with the protagonist facing the most horrific decision that the character would ever have to make. He discussed his desire to use unconventional lighting for a horror movie and the decision to make it his first film shot on digital with hired Red Cams. The filming took three weeks and after a number of changes to the title, it was released on 29 screens. Johannes also talked about the challenges of filmmaking on low budgets and the difficulties of working in the film industry. He spoke of his first five features that were made by spending lots on credit cards and how after trying unsuccessfully to sell one at Cannes, he realised the importance of having a star. He re-cut the film and managed to get Uri Geller to star in it. He talked of waiting for four years for the phone to ring and how his film F went through 35 drafts before being filmed. He left the students with no delusions that the film industry is an easy life with guarantees of great riches. It certainly wasn’t all doom and gloom. Johannes emphasised that drive is everything and that filmmakers must always be conscious of their audience. He was very motivational, suggesting that especially now, there is no excuse to not just get filming and producing. He mentioned the fact that feature films are now being shot on cameras like the relatively cheap Canon 5D. He also talked about his inspirations; books like Lord of the Rings and the work of Stephen King and Terry Pratchett and the films Cujo, Platoon and The Breakfast Club. 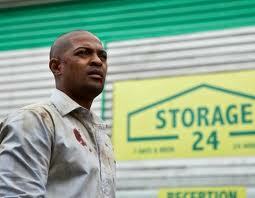 Finally we moved on to the upcoming Noel Clarke starring science fiction, Storage 24, which is produced by Universal. Both Clarke and Roberts worked on the script originally titled Big Yellow. 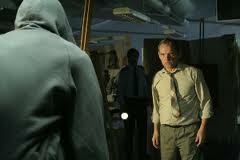 Again, Johannes used some students in the film’s production. He said he is drawn to driven, hard-working people and discussed the popularity of Clarke. His fan base is huge after films like Kidulthood and Adulthood and when Roberts and Clarke have been to conventions and signings together, Roberts has been astounded by the cues of people waiting to meet Clarke. It was a fascinating Q&A and incredibly useful for the students to hear not only an inspirational story of how one man has made it in the British film industry but also a very cautionary tale to those students who think that working in film would be an easy life, all glamour and riches. Cool, thanks for sharing this Pete. Film studies degree a piece of s***? What, that's kind of a mean thing to say, especially considering the school he's speaking at. I'm not that interested in the movie though, but that's cool to have a real filmmaker visit the school. I think to lots of people that want to be in film production, film studies and theory is a bit silly. Most of the students are doing film production so they already know they want to go into the industry rather than studying film theory. But thanks for sticking up for film studies! It was definitely very cool to have him visit! I'm afraid you can just see the back of me in the foreground of the second pic. I'm in the blue shirt sitting on the black stage! Yeah was awesome! Always a pleasure to have real filmmakers talk to the students! It's fascinating to hear their stories!